Yoga guru Baba Ramdev’s much promised revolution failed to materialize as his five-day-long fast against 'black money' came to an abrupt end today when he was taking into custody while trying to relocate the venue of his fast. Ramdev’s tactic of undertaking a Ramlila Ground-to-Parliament House march is seen by many as a face-saving formula because he knew that he would be arrested and won’t be allowed to squat in front of Parliament. No legislators from the UPA government approached him during his fast and Ramdev was forced to repeatedly extend his self-imposed “deadline” for the government to act on his demand. This was in sharp contrast to his immense clout last year when the UPA government had rushed five senior ministers, including the current President Pranab Mukherjee, to the Delhi airport to negotiate with him and persuade him not to go ahead with his fast at Ramlila Ground. Ramdev refused to throw in the towel until late Monday. Indeed, he even sought to emulate Anna Hazare by refusing to leave jail after being released. Hazare had famous refused to leave Delhi’s Tihar Jail last year after being freed. India’s main opposition party, the Bharatiya Janata Party (BJP), openly backed Ramdev and pledged to throw the full weight of the main opposition alliance, the National Democratic Alliance (NDA), in support of him. Ramdev exhorted his supporters to remove the Congress-led UPA from power. BJP President Nitin Gadkari and Janata Dal (United) chief Sharad Yadav were among the top NDA leaders who shared dais with Ramdev today. 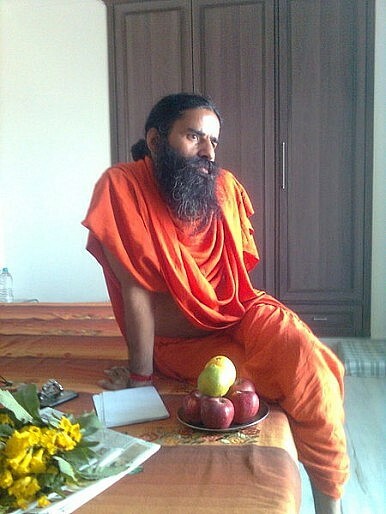 Bolstered by NDA leaders’ presence, Ramdev said, “We are not going to sit silently. The activists will educate the country about this movement. The Congress party should be boycotted… It has become mandatory for the government to insult us.” Gadkari said: “You don't worry, guruji….all members of the NDA are with you." The UPA government did not even bother to react to Ramdev’s attack. Only Congress General Secretary Janardan Diwedi bothered to address the issue at all. "This is a political fight. We, too, are concerned about black money,” Diwedi said. He added, “Steps are being taken to bring back black money."